Here’s a paradox from an influential new study on happiness and digital media. You’re probably less happy than your friends on social media. But don’t worry it’s not you, it’s them. And it’s a paradox simply because the same is probably true of your friends; they are probably less happy than their friends on social media too. Which means everybody is probably less happy than everyone else. Hmm. Sounds weird? An analysis of happiness on Twitter (39,110 users), by Johan Bollen and colleagues from Indiana University bears out this apparently paradoxical finding. The Happiness Paradox is resolved by the observation that popular people in social media – social media influencers – tend to be happier than average (if you take the sentiment of their posts to be indicative of their emotional state), so they skew the happiness average of your social circle upwards. Because you are more likely to follow a social media influencer than they are likely to follow you, the net effect on the average happiness of your online social circle is bumped upwards, making you more likely to be less happy than your social media friends on average – unless of course you happen to be a social media influencer. Which explains the study’s finding that 58.5 percent of participants weren’t as happy as their friends on average. The Happiness Paradox joins the Friendship Paradox in social media (the finding that you are likely to be less popular than your friends on social media). As Bollen notes, if we feel we are less popular and less happy than our friends, then there is a risk that this has a detrimental effect on our happiness through social comparison. Which helps explain the increasingly consistent finding that the more you use social media, the less happy you tend to be (social media not only invites social comparison – which can have a negative impact on happiness by undermining self-esteem, but can also leave a negative sense of having wasted one’s time, as well reducing time doing positive activities that do promote happiness, such as face to face interactions. So what does this mean for digital marketers? Is advertising on social media or working with social media influencers the equivalent to advertising on cigarette packets – endorsing and indirectly promoting something that damages wellbeing? 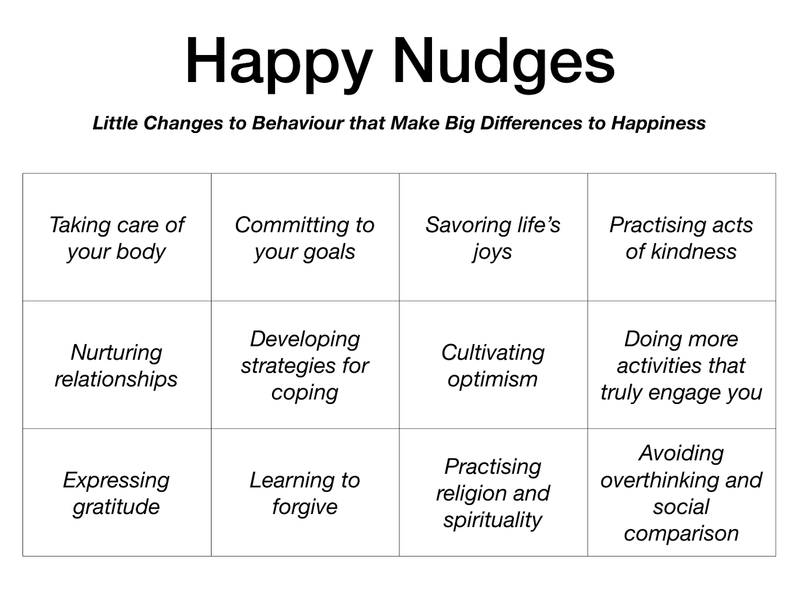 Not necessarily – in my opinion – other studies show that social media can have positive effects too by increasing social support, a sense of community, or promoting behaviour that does enhance wellbeing – activities that I call ‘happy nudges’. If we explicitly design social media campaigns in this positive way to promote community, social support or happy nudges – then social media campaigns have the potential to promote happiness.